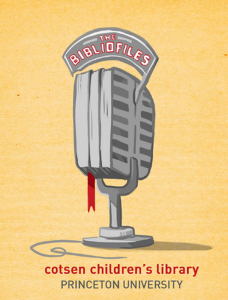 Cotsen Children’s Library has interviewed children’s authors since 2009, and has just made these interviews available for free as podcasts. There is a good mixture of well known authors on there – Philip Pullman, Sharon Creech, Joseph Delaney and Kaye Umansky, to name a few. To read about the programme, and how the author Lloyd Alexander inspired the interviews, see here. To read more about the featured authors including transcripts of the interviews, see here. This is a great archive that Cotsen Children’s Library has built up – thanks to them for making all of this freely available. BiblioFiles artwork by Aliisa Lee. Used with permission. This entry was posted in Authors, Podcasts, Reading Promotion, Resources, Websites by Caroline Roche. Bookmark the permalink.